Pineapple lily/pineapple flower (common name) is a summer/deciduous flower of bulbous origin belonging to genus ‘Eucomis’ of the lily family ( Asparagaceae/Hyacinthaceae family) and sub-family Scilloideae. This plant is mostly native to Southern Africa, Botswana, Lesotho, Switzerland, Zimbabwe and Malawi. Over eleven species of pineapple lily are found in these places. It produces bloom from July to October. It produces attractive star-shaped flowers that resemble the pineapple fruit. It is also named as Eucomis. 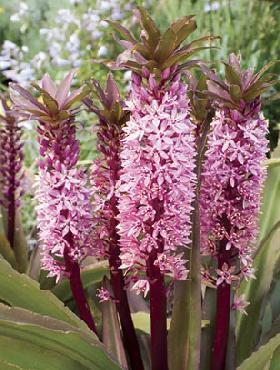 The word Eucomis is originated from the Greek word ‘eu’ meaning ‘pleasing’ and ‘kome’ meaning ‘hair of the head’. Thus, it has turf like leaf resembling lovely hair/beautifully hair along with attractive flowers. If you are a flower lover and is in search of easy growing attractive and unique flowers than pineapple lily will be best suggested to plant in your garden during the summer months. It is easy to care, grow and is rarely bothered by disease or bugs. It is mostly found in areas like swamps, grasslands, forest and river banks but not in areas that are dry for it needs moist well-drained soil to thrive. They are lifeless in winter and frost hardy but will take rebirth during the spring (appearance of thick leaves), in summer they are beautifully grown (flowering time) and will sometimes last till autumn depending upon the time of growth. Pineapple lily is a perennial bulbous plant that gives tropical appearance to the temperate environment. This plant is unique in character and beautiful in appearance; it is a drought tolerant plant, acts as soil erosion controller, groundcover and is deer resistant. It attracts birds and is suitable to plant even in a big flower container. It appears every year to welcome the summer months giving the garden tropical environment for it is the floral representation of the tropical fruit. This tender and non-hardy plant is 12 to 15 inches tall or 2 to 3 feet tall and up to 2 feet wide. Being a perennial plant, it is suggested to store the bulbs during the winter months. The bulbs will start to emerge during at the end of spring followed by rapid growth and the flowers will last for 6 long weeks. This tropical perennial plant requires full sunlight, well drained soil and it should be grown in outdoor container. Flower: Pineapple lily flowers bloom during early fall and late summer months. It blooms mostly during the month of July and August. Flower is formed by the spike of smaller flowers rising from the thick leaves or the small flowers are clustered in cone shape. It has hundreds of star-shaped, waxy blooms of one inch and that is pineapple-like. It has varied coloured flowers like pinkish-purple, white, green, cream, burgundy and some have striped red or purple edges. Some flowers give out faint, unpleasant scent of sulphur for it often gets pollinated by flies. The flowers are composed of six tepals with six stamens and three angled ovary. The flower heads resemble pineapple clustered flanked with green leaves. It can be cut and put in the flower vase to decorate rooms. The flowers are long lasting for the thick spiky stem stays fresh for weeks. It is suggested to change the water in the vase for the longer stay of the flower. Foliage: Pineapple lily has pointed spear-like leaf. It produces light to medium green foliage. It is medium in texture. The fleshy, wide, glossy and strap-like leaves form a basal rosette supporting the flowers to grow from each stem. It is up to 50cm ×10 cm. Bulbs: Pineapple lily grows from the bulbs. You should not lose hope when these bulbs fail to produce bloom in the first year. Wait for a year, than after a year interval, it starts producing attractive blooms. Habitat: Pineapple lily is not a fussy plant; it grows in several climates. It can grow in several types of soil. Belonging to the native of Southern Africa, it needs damp soil to thrive longer. It can thrive well in partial to full sunshine. It grows in its best manner when left to grow in a large container outdoor, in big gardens directly etc. Like other bulbous plants, the bulbs of pineapple lily also go dormant during the cold winter months and will thrive well with condition that there is no frost. · 7 to 8 inches of well-drained soil should be loosened. · Plant at the surface of the soil. · Keep space of 6 to 12 inches if planted in the garden else, one bulb for one container will do. By cutting: Cut off the leaf from the parent plant during the spring and replant in humus-rich soil. By seed: To plant by seeds, sow the seeds in the fall or during spring. · As autumn approaches and winter soon, the foliages of the plant begin to die out. Dig up the bulbs and store in a cool, dry and dark environment of 50 to 60˚F in winter. · Start planting the bulbs in humus-rich soil only after the spring season onsets. · The bulbs should not be fully immersed into the ground but up to 2 to 3 inches (a part of the bulb should be slightly visible to the ground level). · It prefers full sunlight to partial shade during the extreme summer months. · Use compost rich fertilizers once a month in summer and it will grow best if enough compost is added and properly watered during the time of active growth. · Give enough sunlight during the active growth. · Repot the bulbs every once a year if it is in a container. · Keep the soil moist but not too much of water that may lead to rotting of the bulbs. · Places found ­­­­­­: South Africa, Switzerland, Botswana, Lesotho, Malawi, Zimbabwe, North America, Eurasia etc. · Habitat: grassland, forest, river banks, mountain slopes and swamps. Uses: Pineapple lily is used as a piece of decoration due to its unique and long lasting star-shaped appearance. · Although the plant is toxic to some extent, the bulb of this plant has some traditional uses. The bulb when added to water or milk has some important uses in healing backache, urinary infection, stomach ache, fever, colic, syphilis, helps in childbirth, coughs, respiratory infections, blood disorders, prevents premature childbirth etc. They also act as anti-inflammatory. · Their unique look beautifies the garden and can also be used as the wall boundary or as herbaceous border. · When kept in a flower vase, they live for around two weeks.